We have detailed and re-painted versions of this model here. History will always report that the Rebel Alliance was saved from total annihilation by an X-wing starfighter. The X-wing played a pivotal role at the Battle of Yavin, enabling young pilot Luke Skywalker to fly into the Death Star's trench and target a small, two-meter-wide exhaust port. Luke was aided by the Force but the mission would not have succeeded without the X-wing's superior capabilities. In fact, many students of technology claim that the X-wing is the most advanced single-pilot starfighter ever produced. The X-wing receives its name from its double-layered wings, which separate into an X formation during combat to increase the starfighter's field of fire. Each wing is armed with a high-powered Taim & Bak KX9 laser cannon. The cnnons can be fired individually, simultaneously, in pairs, or in any other combination. Proton torpedoes, such as those used to destroy the Death Star, are fired from Krupx MG7 launchers located near the bottom of the vessel. Although the X-wing is designed for just one pilot and no passengers, the X-wing jockey is never truly alone thanks to the astromech socket located behind the cockpit. While in flight and during combat, the X-wing's astromech is responsible for astrogation, navigation, damage control and flight adjustments. The unit can also pilot the fighter in an emergency. R2 astromechs assigned to X-wings carry up to ten jump coordinates for escape into hyperspace. One of the X-wing's greatest assets is its durability. The fighter's reinforced titanium-alloy hull, Chempat deflector screen and deflector shield projectors, and transparisteel canopy ensure that it can withstand several hits without suffering serious damage. In the event of disabling damage, the pilot can deploy the ship's ejection system. The X-wing's history is nearly as important as its capabilities. Designed by Incom Corporation in the early days of the Empire, the X-wing schematics found their way into Rebel hands when several Incom engineers defected to the Alliance. 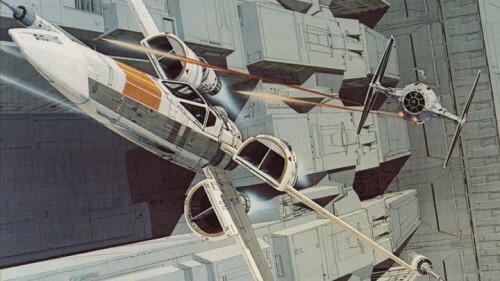 The Rebels began producing X-wings in modest numbers, and the vehicle quickly became one of the most important weapons in the Alliance arsenal. Since the Battle of Yavin, several X-wing variants have been produced. The T-65A3 is a simple upgrade with improved shields, lasers, and targeting computers. The T-65AC4 was designed for increased durability and can withstand more punishment than other X-wings. The newest version of the fighter, the T-65XJ3, was introduced shortly before the fall of Coruscant to the Yuuzhan Vong, and includes three proton torpedo launchers. The majority of XJ3 X-wings are operated by Jedi.